The University Neighborhood Partners (UNP) and Bad Dog Arts are collaborating to provide underprivileged youth on Salt Lake City’s west side opportunities to learn, discover and express themselves through art. UNP is a program at the University of Utah that forms partnerships with organizations like Bad Dog Arts to create a greater sense of community between the U and west-side neighborhoods. It serves as a liaison between the U and west-side nonprofit organizations, resident groups and city governments. “The reason for the focus on the west-side neighborhoods was because those neighborhoods were historically marginalized within Salt Lake City socially and economically and were incredibly under-represented at the U in terms of where students came from,” said Sarah Munro, UNP associate director. UNP has been in this building since 2003. Originally called the West Side Initiative, UNP developed about 10 years ago in response to feedback gathered during 300 interviews with area residents. Currently, UNP has 34 partnerships with 43 departments at the U that each focus on identified issues within the community such as race, ethnicity, religion, political views and geography. Bad Dog Arts has partnered with UNP for three years. 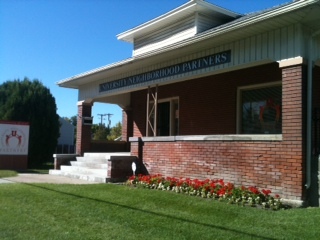 It is located at 824 S. 400 West in Salt Lake City. Bad Dog Arts is a nonprofit organization that aims to inspire “at-risk and underserved” youth ages 5 through 18 to experience the power and freedom to imagine, dare, learn and challenge themselves through art. The hope is that youth will develop self-confidence and be able to use these skills throughout their lives. Through the partnership of Bad Dog Arts and UNP, art classes are offered on a weekly basis at UNP’s Hartland Partnership Center. The center, located at 1060 S. 900 West, is often used as a place for campus-community partnership activities to take place. During the fall and winter of 2011 and the spring of 2012, Bad Dogs Arts will be working with UNP on a mural art project that will be displayed at the Hartland Partnership Center. Through activities and programs like this, UNP and its partners hope to bring together the U and west-side resources and create a community environment of learning that is mutually beneficial.